The cloud is more than just the hardware – its also about services! When talking about the cloud, most people talk about running the servers on the cloud. They talk about the fact that they can start or stop virtual servers with a simple API call. A lot of Cloud Providers do provide you with virtual servers, virtual load balancer and infinite (and/or scalable) storage, but these are all building block of servers. You still need to do the heavy lifting of taking a bunch of servers and making it do the work for you. You need to install the software (not just the one you wrote), mange, handling disaster recovery, backups, logging, etc. What makes Amazon’s cloud unique on top of the servers and storage they provide is the fact that it provides a set of cloud services that can be used as black boxes for your application/service reducing the code you need to write/maintain as well as the number of servers you need to administer. These services are also available for use outside of Amazon’s cloud but there are benefits of using them within your EC2 instances. Amazon Relational Database Services (RDS) – Hosted MySQL which Amazon manage, patches and helps you backup and restore as well as deploy in a smart way across multiple availability zones. Amazon ElastiCache – Hosted Memcached which Amazon manages, allows to resize (add or remove servers) as well as patch with the latest software. Amazon Simple Queue Service (SQS) – A reliable, scalable, persistent queue service. Great for talking with distributed async components. What I love the most about Amazon Web Services is the fact that when they do provide a certain Development Building Block such as Simple Email Service (SES), they do so without killing or harming the competition. There is still enough value and features in other Email services such as mailgun, SendGrid and MailChimp for them to co-exist with SES. Not stepping (too much) on web services developers toes is not something to dismiss and I would love to see the innovation that comes out of Cloud based web services in the future. Ever since Amazon introduced tags in EC2 I felt such a relief that I can name my instances and actually remember which one is which. It took a while for Name tags to find its way to various aspects of the AWS Console, however, connecting to machines still requires a way to find the IP address from the console or via a command line using the EC2 API Tools. I thought that it would be much easier for me and others to utilize the Name tags to connect more easily to the machines. Initially, the script was a simple bash script which utilizes a the ec2-describe-instances command with a flag that matched the Name attribute, however, managed various other command line parameters such as the user name to connect with (ubuntu images, for example, users the ‘ubuntu’ user instead of ‘root’. Amazon Linux AMI uses ‘ec2user’, etc) so I’ve decided to rewrite it in Python and use the magnificent Boto Python library. This allowed better argument handling as well as remove the need to install Java and the EC2 API Tools to access the EC2 API. Don’t forget to send some feedback! All you have to do is select SQS in the metrics type drop down and you will see a set of metrics to select from for all of your existing queues. Amazon’s CloudWatch is a great tool for monitor various aspects of your service. Last May Amazon introduced custom metrics to CloudWatch which allows sending any metrics data you wish to CloudWatch. 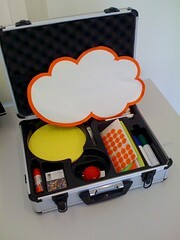 You can then store it, plot it and also create CloudWatch Alerts based on it. One of the things missing from CloudWatch is Simple Queue Service (SQS) monitoring, so I’ve written a small script to update a queue’s count in a CloudWatch custom metric. Having the queue’s count in CloudWatch allows adding alerts and actions based on the queue’s length. If the load is higher than usual you can easily tell via a CloudWatch alert to add an additional machine instance running more worker processes or simply send an Email alert saying there is something wrong. The script is very easy to use and can be run from a cron job. I’m running it as a cron job in 1 minute intervals and have set up various CloudWatch alerts to better monitor my queue. Grab the script on Github at: SQS Cloud Watch Queue Count.